I made a temporary 'bridgedeck' that could be quickly removed but was strong enough to stand, or even jump, on. 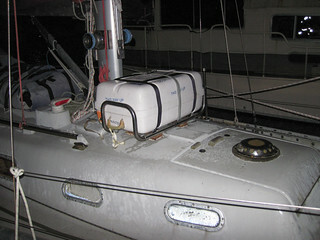 The liferaft was safe and handy, and I had a useful place to put dishes and other utensils while standing at the galley. It also made sitting across the forward end of the cockpit more comfortable. 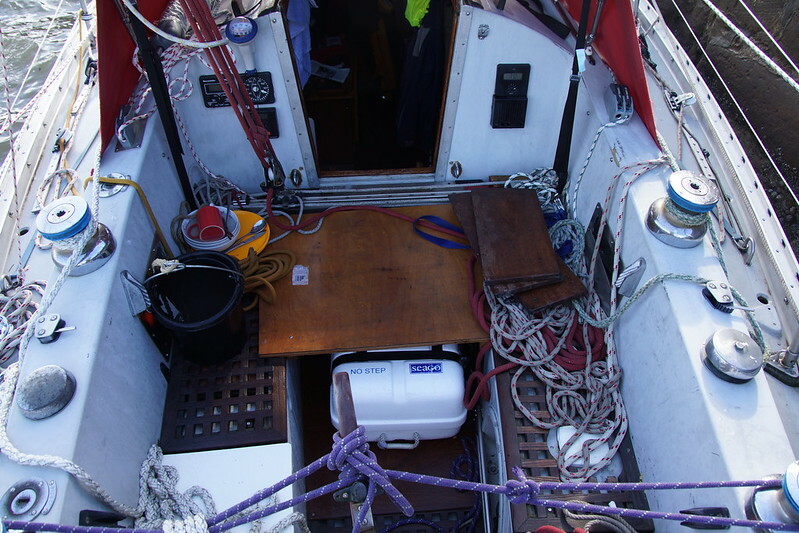 However, it wasn't ideal - the cannister was in the way a bit for the helmsman (on the rare occasions that I was manually helming ...), and the advantages of the 'bridgedeck' could be achieved with a smaller structure. Also, I'd seen a Rival 34 (Southern Rival) with the liferaft stowed very conveniently just in front of the mast, in a location rarely needed for anything else. It was after dark (4pm) by the time I finished up. I have a couple of things to tidy - I'm not too happy with the quick release strap supplied with the cradle.